Home Pot Holes Irresponsible medible handling. VALLEJO — Vallejo police have traced to a gas station convenience store a marijuana-laced cookie that sickened several local elementary school students Monday. The clerk at Calco Mart and Gas gas station and convenience store on Maine Street told investigators that a regular customer gave him the two ginger snaps that he then passed on to a Grace Patterson Elementary School fifth-grader, Sgt. Jeff Bassett said in a statement. The fifth-grader made regular stops to the convenience store, and the clerk would give him small food items, Bassett said. The student shared one of the cookies with three others at lunch Monday, not knowing it had marijuana in it, said Vallejo City Unified School District spokeswoman Tish Busselle. Three of the students were taken to Kaiser Permanente Vallejo Medical Center and released Monday evening. All four were OK Tuesday, Busselle said. The Vallejo Police Department said at least six students may have eaten the cookie, though Busselle said the district has identified only four. 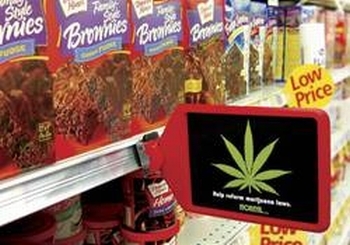 The store clerk told police that he did not know the individually packaged cookies had marijuana, Bassett said. The packages were not clearly marked, Bassett said. A Patterson Elementary teacher discovered the cookies contained marijuana after she read the label of the uneaten cookie when her students became sick. The silver package, branded Auntie’s Edibles, has a cartoon image of a blonde, motherly woman holding a tray of cookies in oven mitts. The cookies’ ingredients are listed as sugar, brown sugar, maple syrup, cannabis butter, whole eggs, organic flour, ground ginger, vanilla beans, baking soda and sea salt. The clerk also was unable to identify the customer who gave him the cookies, Bassett said. The police department has a portion of one of the cookies and both packages, Bassett said. Previous articleAnother SMALL victory. A very LARGE precedent! How irresponsible of that store clerk. Not for nothing but it sounds like he should definitely be held responsible. We should all take EXTRA responsibility when dealing with children and their exposure and education of cannabis. keep the kids off medicine. unless they need it. You would think if someone gave the clerk the cookies, he’d have the decency to mention “oh and by the way, these have cannabis butter in them”. I can’t wrap my brain around the concept of giving away cannabis cookies to someone without telling them there is cannabis in it. That is just rude and cruel and completely STUPID! That clerk seems to have a big heart, that he would give this child little snacks and food before school, I honestly don’t see this clerk purposely giving a child cannabis-laced cookies. He seems like he just cares for the child and was being kind. This is such a terrible mistake! Thank goodness cannabis is not toxic and no real harm was done to the children. Meds shouldn’t be available at a corner convenience store at all…!